Exhausted and exhilarated, we arrived in Bella Roma after a long haul flight from Perth and had less than 24 hours in the Eternal City. Out hotel, Residence Regola, was perfect. 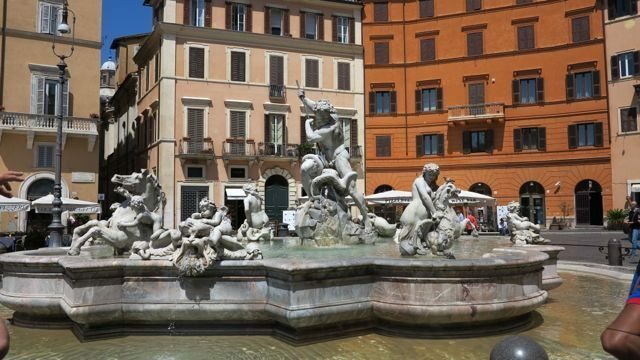 In a great location just two minutes walk to Campo dei Fiori, two minutes over the pedestrian bridge Ponte Sisto to Trastevere, and five minutes walk to Piazza Navona. Tucked behind a boom-gate protected piazza, this little boutique hotel with just six rooms was whisper quiet, spotlessly clean, and had a new fit out. We booked through booking.com and paid 151 Euro (A$225) per night. The king size bed and rain shower were worth it. With just one night in Rome, we forced ourselves to go out, despite not checking into the hotel until 9.30pm local time. After a short walk to Trastevere in the rain, we decided to eat at Osteria Ponte Sisto, a restaurant I’ve eaten at previously several times. It’s not the most amazing restaurant in the world, but in our jet-lagged state, it was adequate. We both had a traditional Roman dish, spaghetti carbonara (8 Euro, A$11), with homemade fresh pasta. The pasta was beautifully cooked, but the sauce, if I’m honest, was overloaded with pepper and not silky like it should be – the eggs had scrambled, but I enjoyed it anyway. The house red wine at 10 Euro ($A15) was quaffable. We slept until our bodies woke us. By the time we got ready and left the hotel, we had four hours – we had to be back at the hotel at 2.45pm to pick up our luggage and take a taxi to the airport. 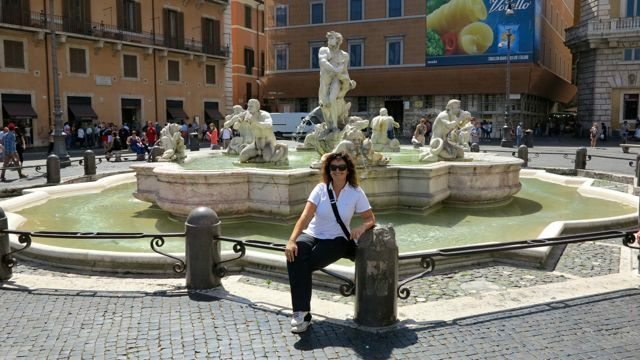 My only objective – throw a coin over my left shoulder at the Trevi Fountain (which means that one day you will return to Rome – it’s worked every time to date), and Zorba’s objective was to have a nice lunch and gelato. First stop was for a cappuccino – enough said. No breakfast required as lunch was just an hour or so away. Then Campo dei Fiori. The Greek bought two tomatoes from the market, washed them under the fountain, and ate them like an apple. It’s his Roman tradition. Second stop was Piazza Navona, one of the most beautiful squares in the world. We popped inside the Brazilian Embassy that was having an open day and stared in awe at the beautiful fountains of Neptune, the God of the Seas. And there’s a obelisk, one of 27 in Italy that the Romans stole from Egypt, which only has 11. We walked past the 2000 year old Pantheon on our way to the Trevi Fountain and stopped to have a quick look inside. 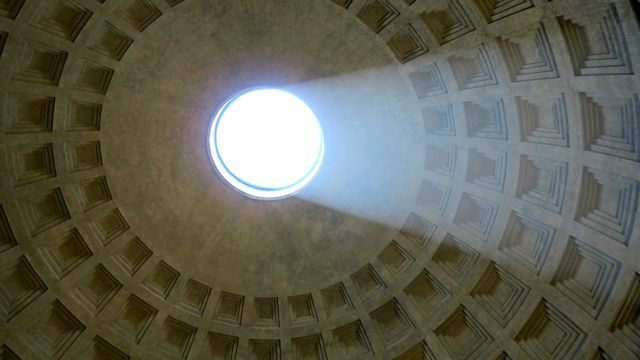 It’s a marvellous example of ancient architecture – the perfectly designed dome has a hole at the top that lets in light, and if it rains, there are drainage holes in the marble flooring that is sloped every so slightly so the water drains away. When we reached the Trevi Fountain, we were in the company of about 45,000 tourists. It was horrendously busy, as it always is. I took some quick snaps and we threw coins over our shoulders. Lunch was next. We walked and walked to a restaurant I’d read about, Ristorante Duelle, which was not open for lunch. Grrr. We spent five minutes searching Trip Advisor for a nearby restaurant. Unsatisfied with that, we decided to head back towards Piazza Navona and find a restaurant that wasn’t a tourist trap – a mission in that part of Rome. Time was ticking and we had to hurry up. Fatto in Casa, in a quiet-ish street looked inviting, even more so when I spotted a couple of Nonna’s and another table of Italians. There were no A-frame signs out of the front with pictures of food, or spruikers trying to entice people in. We sat, my feet welcoming a rest, and decided that this placed ticked the boxes: authentic menu with traditional dishes, reasonable prices, tables of locals, and not in sight of any major monuments (which tend to rip off tourists and serve below par food). It proved to be a winner. My antipasti of panzanella – a tomato, bread, and basil salad was flavoursome, but it was the stuffed pumpkin flowers that I worshipped. I’ve had stuffed zucchini flowers plenty of times, but this was a first. Stuffed with mozzarella and anchovies, the out batter was crisp and when cut, the cheese oozed out. I needed to add a little salt to the batter which made it a memorable dish. Zorba’s mozzarella di buffalo (buffalo mozzarella) was soft, but not oozy like some we’ve had before. His main, spaghetti carbonara, was luscious. The egg and pancetta sauce that coated the al dente pasta was silky, smooth, and rich. A much better version that the carbonara we had last night at Osteria Ponte Sisto. My main of cut danish beef steak with rocket, tomato and balsamic, a traditional Roman dish, was delicious if I was selective with which parts of the steak to eat. The ends were a bit tough, but the centre was rare and tender. With one hour to go, we paid ‘il conto’ and walked towards Campo dei Fiori to go to Grom, a well regarded chain of gelaterias. Besides the classic flavours on the menu like caffè that I ordered, they change each month with non-traditional flavours such as sugar and salt. I loved the sugar and salt – it was like a creamy salted caramel. Four years ago, there was just one Grom gelateria in Rome and it was so popular that we had to join a queue that went out the door. Now there are six, and no queues. And there draws and end to our Roman time. I tend to agree with Zorba who said he feels robbed that we haven’t allowed more time in Rome. A sacrifice we had to make for the Monaco Grand Prix. Next stop, Nice. p.s this could be my last blog post because a certain someone only packed a power adapter that takes 2-pin plugs – my laptop has a 3-pin plug and is almost out of battery…hence the lack of photos in this post – sorry!